Physico-structural properties of biodegradable films of chitosan and polycaprolactone (PCL) added with Moringa oleifera leaf extract were determined. The films were analyzed for thickness, transparency, solubility, Fourier transform infrared spectroscopy (FTIR) and X-ray diffraction (XRD). The transparency was increased as the PCL concentration increased and there was no difference in solubility for any of the formulations evaluated. On the other hand, FTIR spectra revealed an increase in hydroxyl groups, amides and carbonyls bands as the concentration of PCL and M. oleifera extract increased. 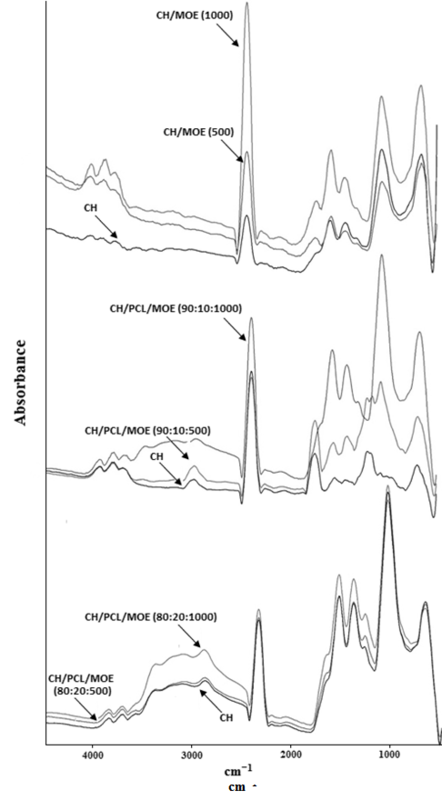 XRD diffractograms showed a good miscibility between chitosan and PCL using concentrated acetic acid as the solvent. The properties of PCL to modify the physico-structural characteristics of chitosan are maintained.